Belgian Gymnastics: My 2015 Belgian gymnastics highlights! Now that the year is almost over, it is time to have a look back to the best moments of the 2015 gymnastics season! For many years now, Belgium has produced very promising young gymnasts and some have said that this year's Juniors were the best our country has had. As I was reading other gymnastics blogs, I couldn't help but notice that our Juniors, and the ones turning Seniors in 2016 in particular, caught the eyes of those bloggers and fans. Of course, we have Nina Derwael and Axelle Klinckaert. Nina's uneven bars routine is astonishing and everybody was talking about Axelle's floor routine. But let's not forget Julie Meyers and Senna Deriks, who had a great year, as they competed in several international events (FIT Challenge, EYOF, Massilia, Top Gym) and had the chance to gain some more experience. There are also Maellyse Brassart and Chloé Leblicq. They won't turn Seniors until 2017 so they will mostly have a look on the 2020 Olympics. But before that, they will try to earn a spot in the Juniors team for the European Championships. New Juniors such as Amy Lejeune already competed in some tournaments this year, mostly in the Youth or Espoirs categories. On the men's side, the year was also very busy with Noah Kuavita, Iliaz Pyncket and Takumi Onoshima competing at the European Youth Olympic Festival where they qualified in for 4 finals. Others like Lukas Fickers, Justin Pesesse or Jonas Delvael also took part in friendly meets where they had the opportunity to compete against some of the best Juniors gymnasts. Iliaz and Lukas will be 18 in 2016 and will join the Seniors ranks. I couldn't choose one single event (except for EYOF, read below) as our gymnasts shone more than once this year. I didn't know what to expect from this brand new competition. At first, I thought "ok, it is like a mini European Championships/European Olympic Games". I was very impatient to see how it would work and what our Belgian gymnasts would do. I know my blog is focusing on artistic gymnastics, but I'd like to talk a bit about our acro gymnasts. The results they had in Baku were amazing. Even more than that! 3 golds for Ineke van Schoor, Kaat Dumarey and Julie van Gelder and 3 silvers for Yana Vastavel and Solano Cassamajor. I didn't know a thing about acrobatic gymnastics but I've learned to like it and I really hope this sport will become an Olympic discipline in the future. Now, back to our artistic gymnasts. On the men's side, Belgium was represented by Gilles Gentges, Luka Van Den Keybus and Jimmy Verbaeys. In Baku, they placed 18th as a team and Jimmy advanced to the all-around final where he finished in 16th place. Gaelle Mys, Lisa Verschueren and Cindy Vandenhole placed 10th as a team. In the all-around final, Gaelle was close to the podium, finishing in 6th place, 1.5 points away from a medal. But the best result (and maybe the most frustrating one) came on the floor exercise final, where Lisa ranked 4th, just outside of the podium. 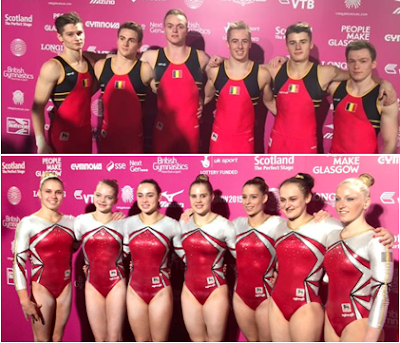 As we didn't know how would this competition go, I think team Belgium had pretty good results. I really enjoyed watching this competition and I think that for a first, it was a good way to prepare for what came next in the season. What? Only in 3rd place? Yeah, I know... But as I said, you could swap places between my top 5 events, I'd still like it anyway. The European Youth Olympic festival is like a mini-Juniors European Championships. Belgium has shone there in the past but the 2015 edition was just the best in my opinion: 6 medals and 11 finals! If the boys didn't bring home any medal, they still reached four finals. Iliaz Pyncket, Noah Kuavita and Takumi Onoshima placed 8th as a team. And they could have ranked higher as they had mistakes. Noah and Takumi then advanced to the all-around final, where they both reached the top 15 (Noah was 13th, Takumi was 15th). Iliaz also qualified for two finals, on floor exercise and horizontal bar (5th). This year's EYOF was Julie Meyers' first big competition and she helped team Belgium by winning a silver medal. Individually, she placed 26th in the all-around. In addition to the team silver, Nina Derweal then placed 4th in the all-around before winning two medals: silver on bars, just 0.050 away for the gold medal, and bronze on floor. But the most successful gymnast in Tbilisi was Axelle Klinckart, who won three other medals, in addition to the one she had with the team. She first won silver in the all-around. She had the exact same score as Russia's Daria Skrypnik but due to the tie-breaking rule, she earned a silver medal. But she then came back strong from this to win two golds, on balance beam and floor exercise. I wanted to establish a ranking here, between our all-arounders. But then I thought that I had no right to choose between them, to put one performance ahead of the others. And I couldn't do so even if I wanted to. Because the all-around performances of our gymnasts were simply all historical. For the first time ever, a male gymnast from Belgium qualified for the all-around. And even if this experience didn't go as planned for Florian Landuyt, only 19, we can't take anything away from what he has achieved in Glasgow. Florian impressed me by his ability to come back strong after a mistake. He didn't have a good podium training, but he came back strong in team final. He didn't have the best all-around debut, but he didn't let go and continued his routines. Surely, finishing an all-around competition on an injury is every gymnast's nightmare but Florian is young and I'm sure we'll see him again in final in the future. On the girl's side, history was made too. It wasn't the first time two gymnasts qualified for an all-around final (Gaelle Mys and Laura Waem did so in 2013), but Rune Hermans and Lisa verschueren were the first one to finish both in the top 20. In addition to that, they were solid on both team qualifications and all-around final. There were some concerns about balance beam, as our gymnasts seemed to struggle on this event. But when it had to count, it counted, and our gymnasts delivered good performances. In the all-around, Rune and Lisa improved their qualification rankings. I knew they could do it, but their performance is truly amazing and will be remembered. Rune was a promising Junior and she continued to step up her game to become a lock on the team. As for Lisa, well ... We all know what happened to her recently. And while it is heartbreaking, this result will remain a historical moment. Being 17th in the World, the best ranking ever at Worlds for a belgian gymnast, is something Belgian fans will not forget. Is this a surprise? I'm sure you saw that coming. Not only our gymnasts made history individually, they also made history as teams, though on different levels. The women's team placed 11th for the second year in a row, increasing their team total and qualifying for the Rio Test Event (April, 17) for the second time. Let's be honest, if this result is superb, it isn't really a surprise. The top 16 was our team's goal for a long time and it would have been a huge setback if the team didn't qualify for the Test Event. Nevertheless, their performance is still a great result and shows that Belgium is now a team you have to take into account. I, personnally, was more impressed with the men's team result. They already made history last year by qualifying for a pre-olympic World Championships for the first time ever. They made history once again by placing 17th in team qualifications, just one spot away from the Test Event. Disappointment was everybody's first reaction (mine included, although, as I mentionned it in my recap article, I was disappointed for them, and not in them), but then, you realize they achieved a result nobody was expecting. You hope for it, you pray for it, it slowly sinks in into your mind that they could do it, but you never truly believes it. Not because our men's team isn't good. On the contrary, I think the men's team is the best we ever had and a lot of new talents are coming. But because it just wasn't expected. There were no real expectations about our men's team. We were just happy for them to be there, but we never thought they could rank that high. And honnestly, that's a shame. For years now, the boys increased their difficulty, increased their skills, polished what they already performed and had an amazing team spirit. Knowing they ranked 17th in the World is phenomenal when you know where they came from and there is no doubt to me that they will qualify a full team for the 2020 Test Event (and who knows? Maybe the 2020 Olympics).